to a maximum length of 17 metres and 100 tonnes. usually inconspicuous, although fluking, pectoral fin slapping and even breaching have been known to occur. 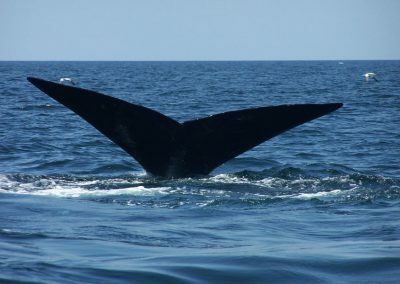 There are three species of right whales recognized in the world, Eubalaena australis (the Southern right whale), Eubalaena glacialis (the North Atlantic right whale), and Eubalaena japonica – the North Pacific right whale. 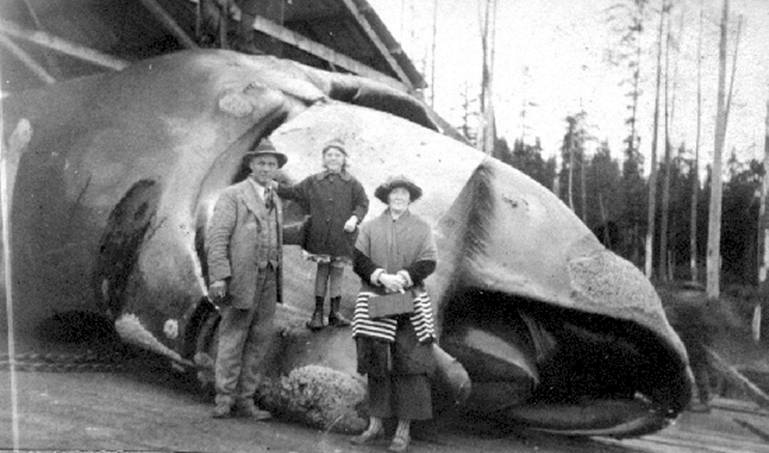 Right whales were named by whalers because they were the ‘right’ whale to hunt. They are very slow moving, easy to approach, live close to shore, provide vast quantities of oil, meat and bone, and their carcasses float. Due to intense whaling during the 17th and 18th centuries, the population of North Pacific right whales is now thought to number less than 100, making this species the most endangered whale in the world. 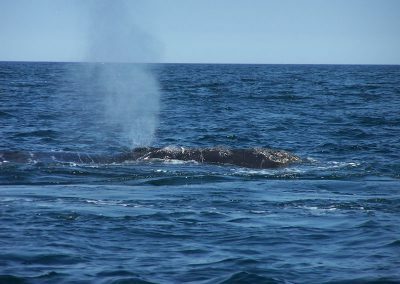 A confirmed right whale sighting had not occured in British Columbian waters since 1951 until one was photographed and observed by scientists with Fisheries and Oceans Canada in June 2013. Read about this sighting here. 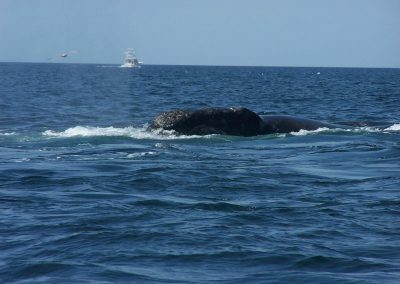 Right whales generally inhabit temperate to sub-polar inshore waters. Calving grounds are in very shallow regions of these waters. Newborns are 4.5 to 6 metres in length and weigh about 1 tonne. In 2002, a female with a young calf was observed in the Bering Sea. This was the first calf seen in the past century. 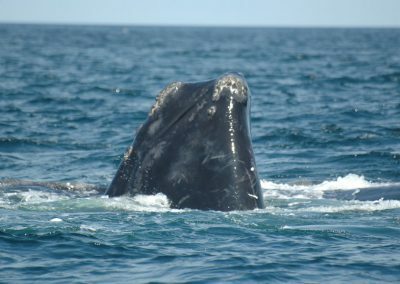 It is believed that right whales spend summers in higher latitude waters feeding, and females go to warmer sub-tropical waters for winter calving. Little is known about the current distribution of north Pacific right whales because of their extremely low population size. 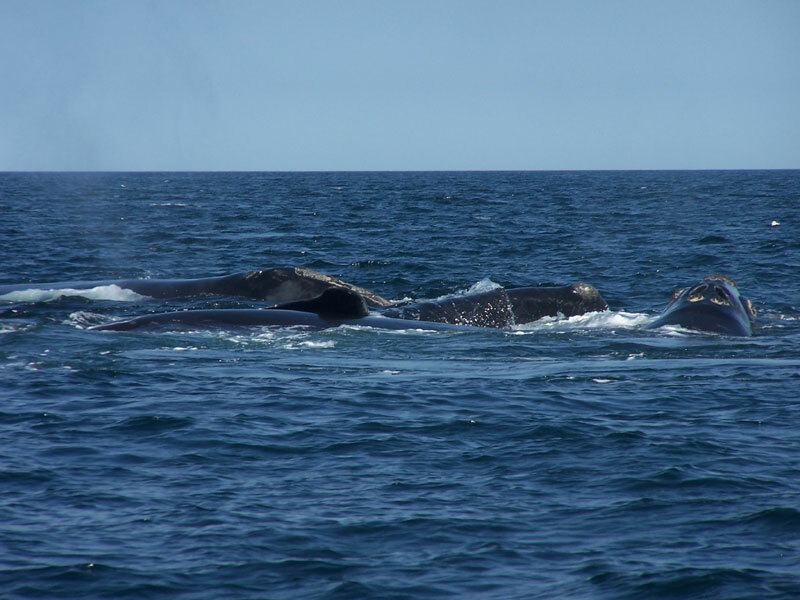 Right whales are more closely related to bowhead and grey whales than to the “rorqual” whales (such as humpback whales and blue whales). Right whales feed mainly on copepods – plankton about the size of a grain of rice. In the southeastern Bering Sea, the species Calanus marshallae is the most important prey species. However, they will also feed on small krill (small, shrimp-like plankton) and the larval stage of many other species of crustacean. Right whales are “skimmers” or “ram filter feeders” – feeding by swimming forward with their mouth wide open. They frequently skim the surface for food, but also feed at depth and have even been seen with mud on their heads after a long dive, indicating that they were feeding on the bottom. The North Pacific right whale is designated as Endangered by the Committee on the Status of Endangered Wildlife in Canada (COSEWIC). Although there have not been sightings of this species in the last 50 years in Canadian waters, there have been sightings both south and north of British Columbia waters. Therefore, it is not appropriate to classify the species as extirpated. The total population in the eastern North Pacific likely numbers a few tens of animals. Mellinger, D.K., K.M. Stafford, S.E. Moore, L. Munger, and C.G. Fox. 2004. Detection of North Pacific right whale (Eubalaena japonica) calls in the Gulf of Alaska, 1999-2001. Marine Mammal Science 20(4): 872-879. Shelden, K.E.W., S.E. Moore, J.M. Waite, P.R. Wade, and D.J. Rugh. 2005. 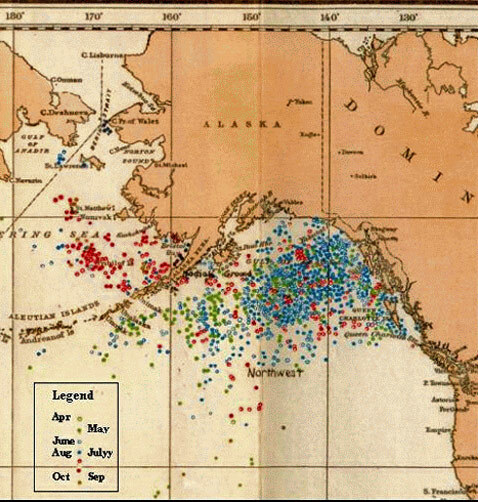 Historic and current habitat use by North Pacific right whales Eubalaena japonica in the Bering Sea and Gulf of Alaska. Mammal Review 35: 129-155. Shelden, K.E.W. and P.J. Clapham. 2006. 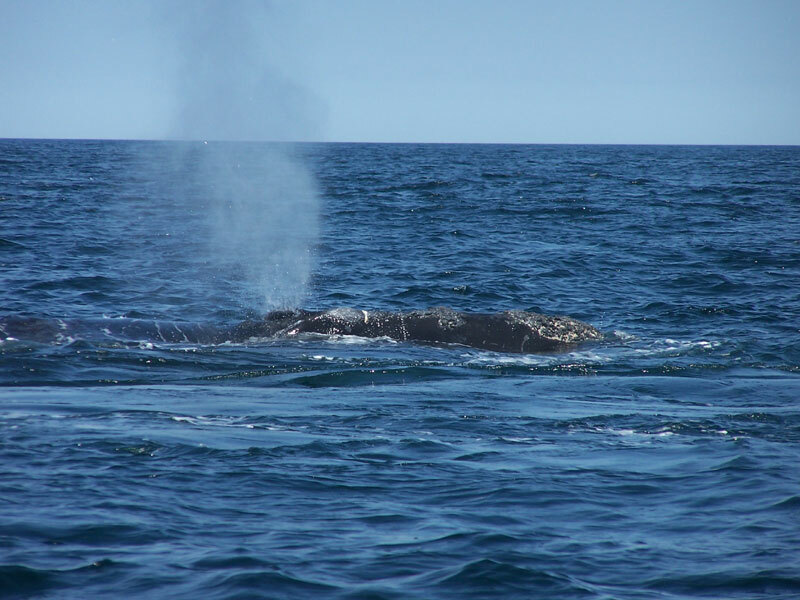 Habitat requirements and extinction risks of eastern North Pacific right whales. AFSC Processed Rep. 2006-06, 52 p. Alaska Fisheries Science Center, NMFS, NOAA, 7600 Sand Point Way NE, Seattle WA 98115. Wade, P., M.P. Heide-Jorgensen, K. Shelden, J. Barlow, J. Carretta, J. Durban, R. LeDuc, L. Munger, S. Rankin, A. Sauter and P. Stinchcomb. 2006. Acoustic detection and satellite-tracking leads to discovery of rare concentration of endangered North Pacific right whales. Biological Letters 2:417-419. Waite, J.M., K. Wynne and D.K. Mellinger. 2003. 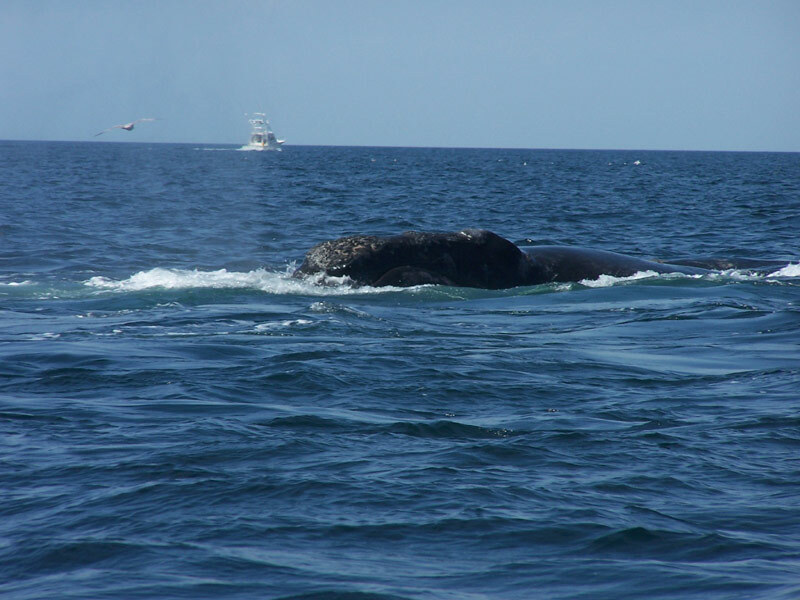 Documented sighting of a north Pacific right whale in the Gulf of Alaska and post-sighting acoustic monitoring. Northwestern Naturalist 84: 38-43.